View More In Luggage Straps. The S.O.S. 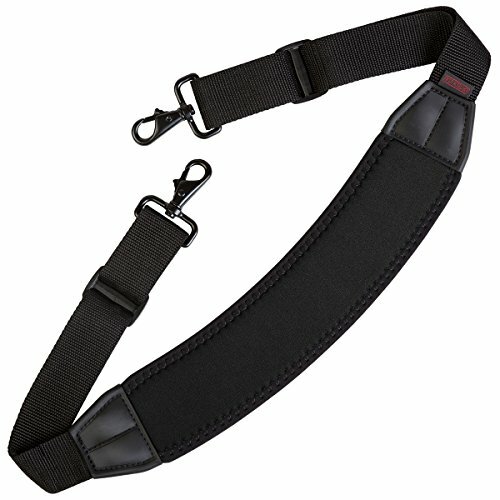 Strap "Saves On Shoulders" with its unique internal control-stretch system and tailored design that effectively distributes weight and absorbs shock of movement. It's the perfect strap for heavy bags and cases. The metal swivel snap hooks secure the strap to most bags and cases; however, they can be easily removed if the 1.5" (38,1mm) webbing is the preferred connection option. The S.O.S. Strap has 2.75" x 11" neoprene pad with non-skid surface and 1.5" metal swivel hooks and webbing. The S.O.S. Curve Strap is the same as the S.O.S. Strap except that it has a slight curve to the neoprene pad allowing the strap to rest more securely on the shoulder. The recommended load for carrying is up to 30 lbs (13,6kg). The Mini S.O.S. Strap has a slightly smaller neoprene pad (2.25" x 10") with non-skid surface and uses 1" webbing with metal swivel hooks. The recommended load for carrying is up to 25 lbs (11,33kg). If you have any questions about this product by Neotech, contact us by completing and submitting the form below. If you are looking for a specif part number, please include it with your message.